It's a mediocre car. You get what you pay for. It may look decent for the price but there are a lot of cheap aspects to the car. Starting with looks... my car is a dark blue overall pretty nice to look at for the price of the vehicle. The shape of the car is what caught my eye the best. Sadly though my car has had some problems and when researching I noticed it's common issues and can be expensive issues. My gas gage went out on my car and when I talked to someone about it they ranged the fix from couple hundred to couple thousand. When researching I noticed it's a common problem with that model of a car. Luckily my husband is really good at fixing things and it cost us $180 to fix but we had to pull out the gas tank to fix it and of course the part that was broken I had to buy a whole set as the part isn't sold individually. I've had constant problems with my seat belt sensor not working saying my seatbelt isn't on when it is and my car will constantly ding. Then lastly the seal on my car door and windows are really bad in the winter time. Every year they are constantly freezing and I can't get my car door open or if I do it then won't close. Same goes for my window. Most of the time my window won't roll down in winter time. Never seen a car have that issue so much. I would not buy due to reported issues with the brakes. I cried the night I drove it 'home' because the car struts or brakes were awful. I couldn't drive over 40 mph because braking was off. The GPS was hard to see and the roads had limited lighting. I do not like this vehicle because the seat sits too low and there is too low or rather does not adjust for my 5' 3" height. There are few features for me. I really need plug ins for other equipment since I am in my vehicle a lot. 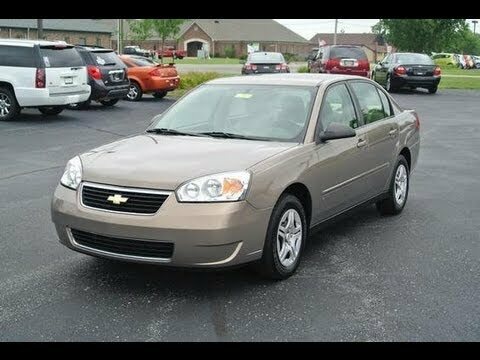 2007 Malibu - great, reliable, cute. I love my Chevy Malibu. Even though it is a 2007 model, it still runs great. I recently got a new radio installed with Bluetooth capability and it is a game changer. I haven't had any problems with it - messages show up on the dashboard when something is wrong. The only complaint I have is that there is no light in the front of the inside - always was strange to me but other than that it is a great car!